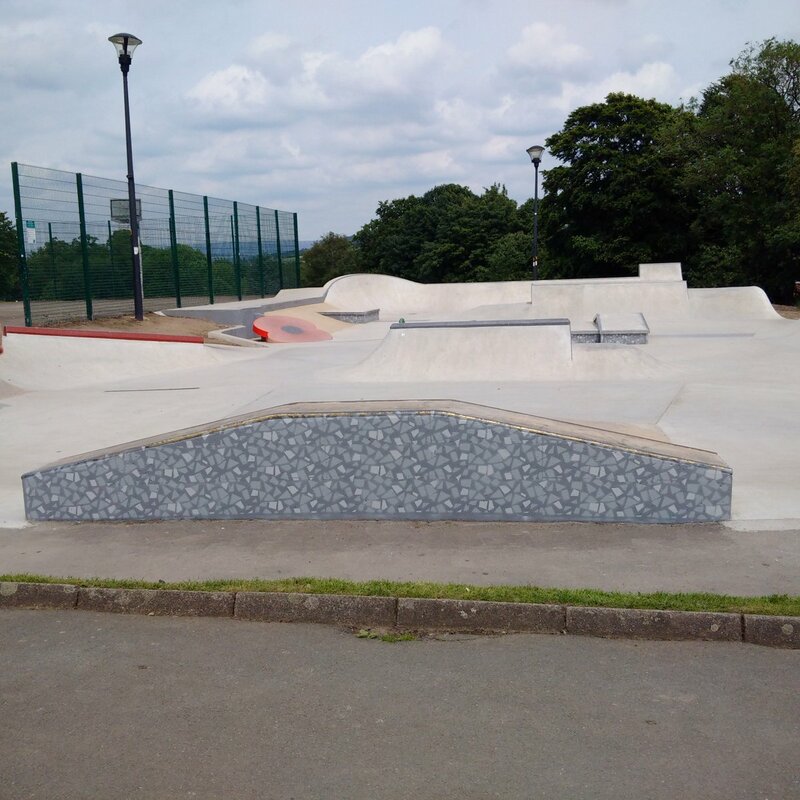 Re: Marple Skatepark Fund-raising target of £100,000 Reached! But many people will never feel safe using the path without a fence to protect them from the fast-moving children on dangerous bikes etc equipment. Then they can access the court across the grass, which is what most people will do anyway. these would be people using the path to go and play basketball on the court, yes? and you think such people will be frightened by bikes? Do you ever walk along the pavement, next to the road used by articulated lorries and cars which are FAR more likely to kill or injure you than a bike? No, this is not necessary according to RoSPA regulations. The regulations require a 2m distance between a path and the nearest obstacle. We are complying with this. But many people will never feal safe using the path without a fence to protect them from the fast-moving children on dangerous bikes etc equipment. Will the footpath be fenced so people feel safe walking along it? AT LAST! 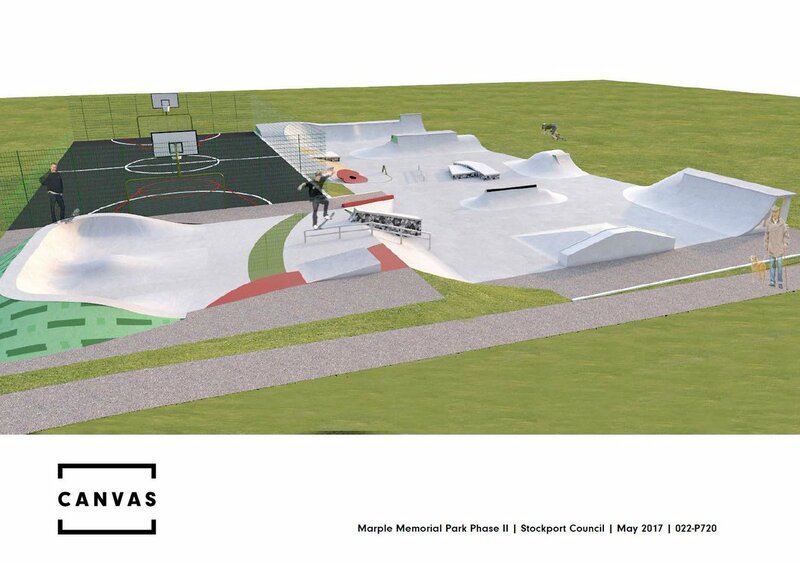 Planning permission for Marple Skatepark Phase II has been granted! The planning application submitted in December last year was finally granted by Stockport Council yesterday. The plans are for improvements to the small top section of the existing skatepark and the transition to the lower section; plus resurfacing of the existing basketball court and additional fencing, turning the court into a modern Multi-User-GAmes facility (MUGA). The process has taken a long time because comments objecting to the plans submitted in December were received. Of these comments, the planners decided that one in particular needed to be addressed. This was that “there would be no hard-standing access to the new sports area (existing basketball court)” once the improvements were completed. This has taken considerable time to reach a satisfactory conclusion, as the only way to provide this without restarting the planning process from scratch was to create a new footpath within the footprint covered by the existing planning application. This forced us down the route of adding a footpath along the top edge of the skatepark area (the strip shaded a peachy colour in the 3D visual). 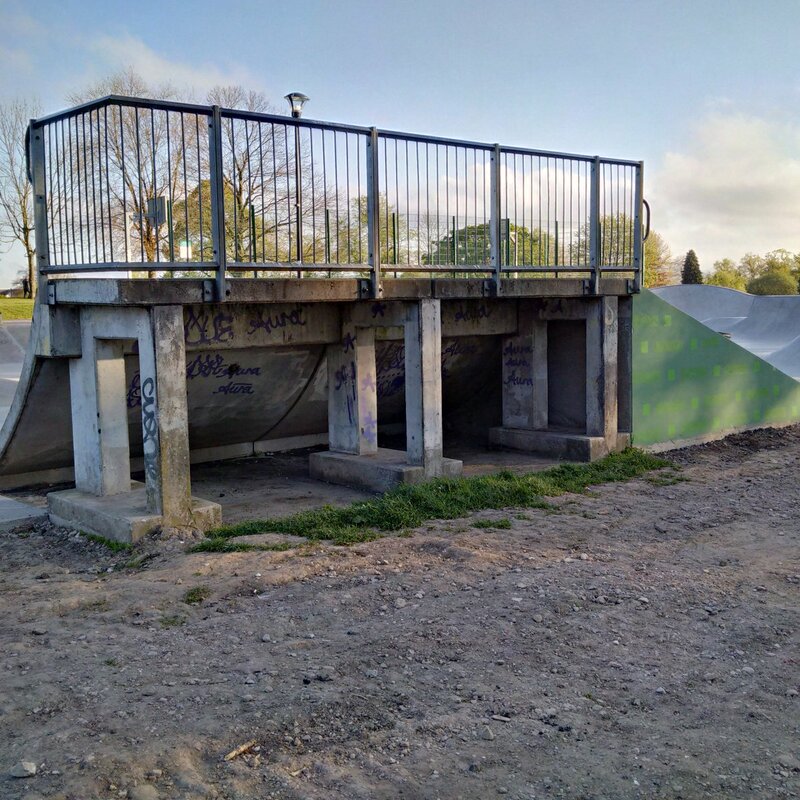 Unfortunately, RoSPA regulations for skateparks stipulate that you cannot have a footpath closer than 2 metres from a skatepark obstacle or feature. This meant that we effectively lost a 3 metre usable strip in total from the top section of the skatepark. The loss of this space meant that we had to make significant changes to what we had originally hoped to do with the top section design, as you will see if you compare the approved plans with what was originally submitted. But, we are where we are, and at last it's approved and we can move forward. The next stage is to firm up the costs for the whole of Phase II. Discussions are ongoing with the skatepark contractor to confirm their costs for the skatepark element and to satisfy the council's procedures for a single tender action. The MUGA element of the works is expected to go out on competitive tender before Christmas and once we have both prices finalised we will know how much money we need to undertake the full works planned. The really good news is that £85,000 of Formal Sports Commuted Sums has been approved by the council for this scheme. We won't know for a while if this is quite enough to do the whole project but if not, it will certainly be a very significant proportion of it. Obviously once we know, and if there is a shortfall, we will look for ways to raise any extra money that is needed. It may interest Marple people to know that the formal sports commuted sums have come from the Morris Homes development on Hibbert Lane. 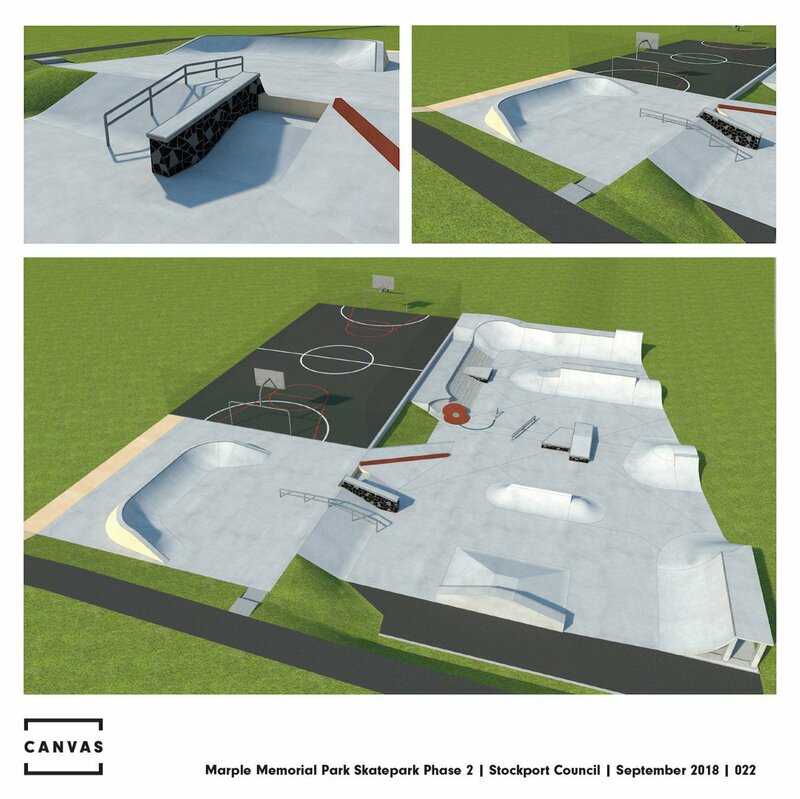 It's been pretty quiet from Marple Skatepark Development Project for a while. We hope everyone's been enjoying the new skatepark while we've been beavering away with the council and Canvas Spaces behind the scenes. 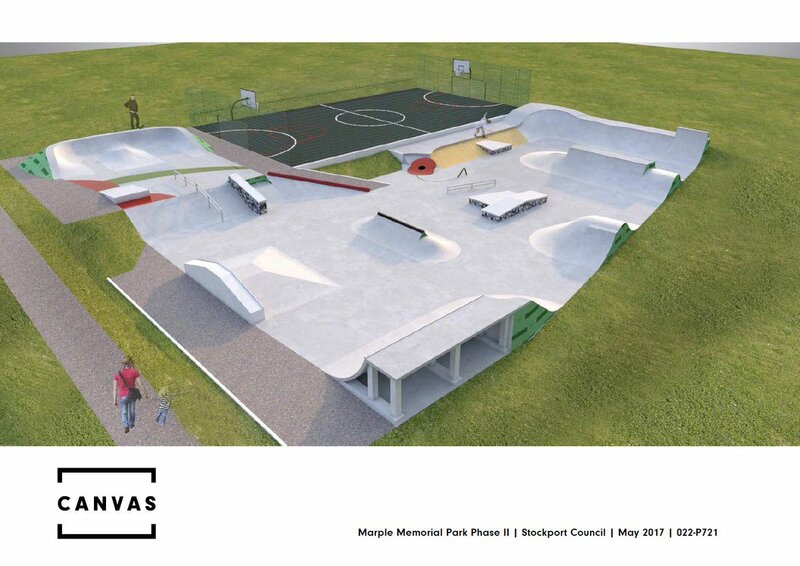 We are now pleased to be able to advise that (at last) a planning application for Marple Skatepark Phase 2 was submitted for approval yesterday. Once the plans are on the Planning Portal we'll provide a link. 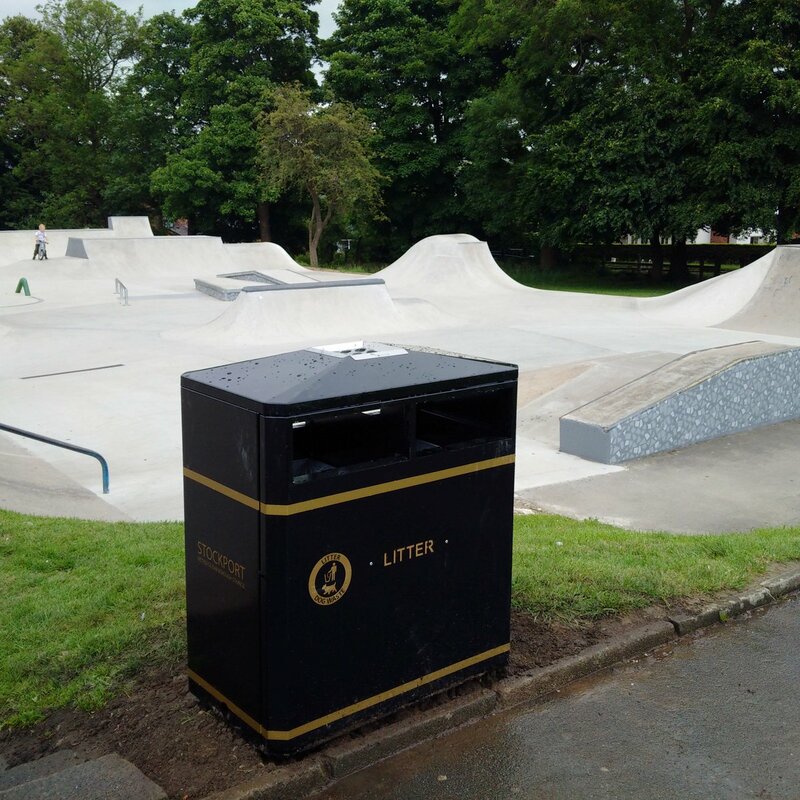 The scheme is the one we displayed at the Carnival in the summer and features improvements to the small top section of the skatepark plus resurfacing of the basketball court, turning it into a Multi-User-GAmes facility (MUGA). It is important to understand that we don't have the money for this yet. We will need around £75k to make it happen. But the planning application is the first essential step on the way to being able to make further progress. We'll give you more news when we have it. In the meantime, we encourage users to keep enjoying the new skatepark, treat it well and respect all users and other visitors to the park. Come along to the Team Extreme Event at Marple Carnival today and check out our ideas for the top section of the skatepark and the basketball court, which we'd like to turn into a MUGA (multi-user games) facility. We're going to need around £75k to do this though and of course we haven't got any of that yet! A masterclass in how to take it to the wire but Stockport Council has delivered on their promise to get the new double bin installed in time for Marple Carnival! 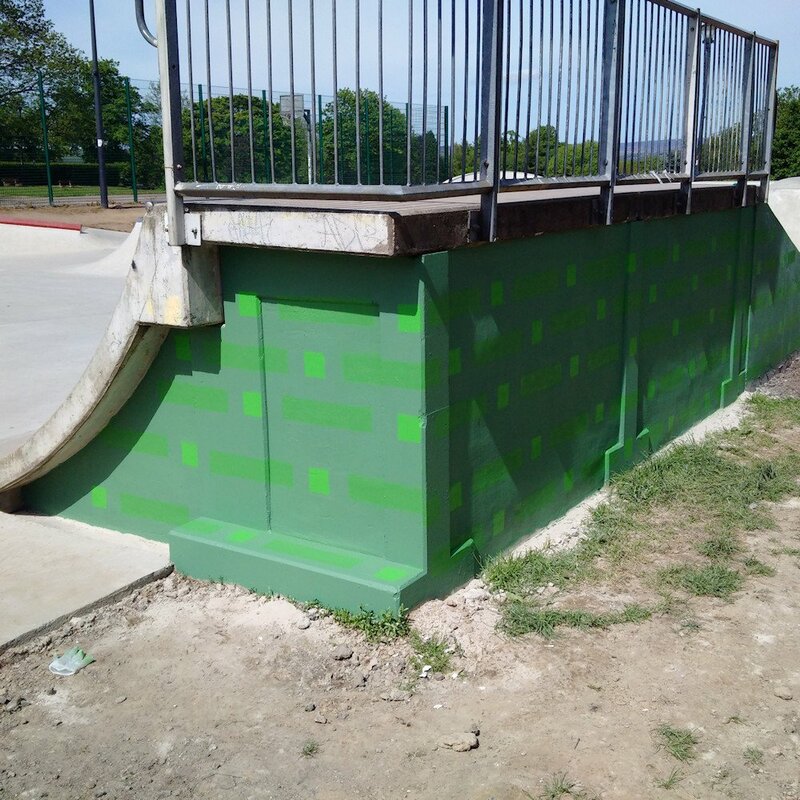 Today we have mostly been painting and stencilling the old skatepark ramps to match the new part (and the seating installed yesterday). We wanted to get this done before Team Extreme Event at Marple Carnival. Hope you like it? A council contractor is expected to start the resurfacing works to the main pathway into the park between the main entrance and the war memorial today. The work should be completed this week. Of course the contractor was working to council time and hasn't started yet after telling us on Friday that they would! Latest promise (yesterday) is that the work starts today. 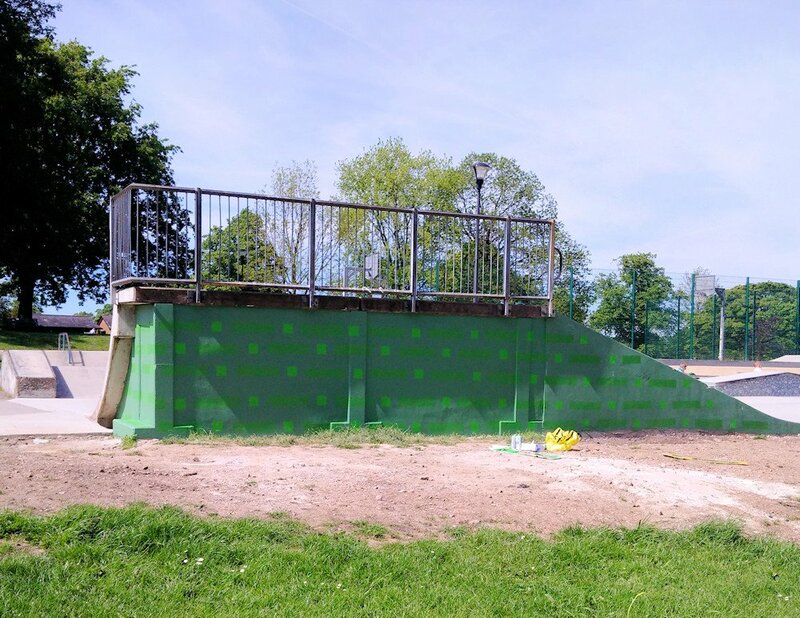 Yesterday we mostly painted and stencilled the back of the old quarter-pipe to match-up with the new skatepark. Someone had damaged the screed by digging their name into it over the weekend, so we filled and repaired that too. 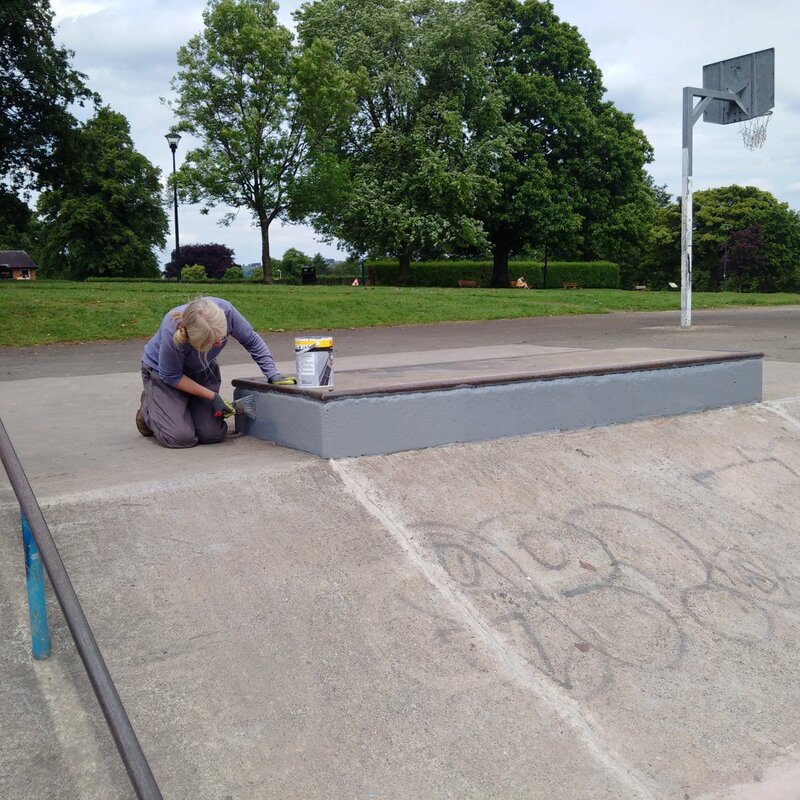 We hope that park users will respect the efforts we've made to improve the skatepark and just enjoy using it over the Bank Holiday weekend!